The patterns for the wolf and the pigs are now all available. Free! I love your little pigs and the "Big Bad Wolf"! The story you wrote was cute too! What a wonderful little play set they'll make for some lucky kids! 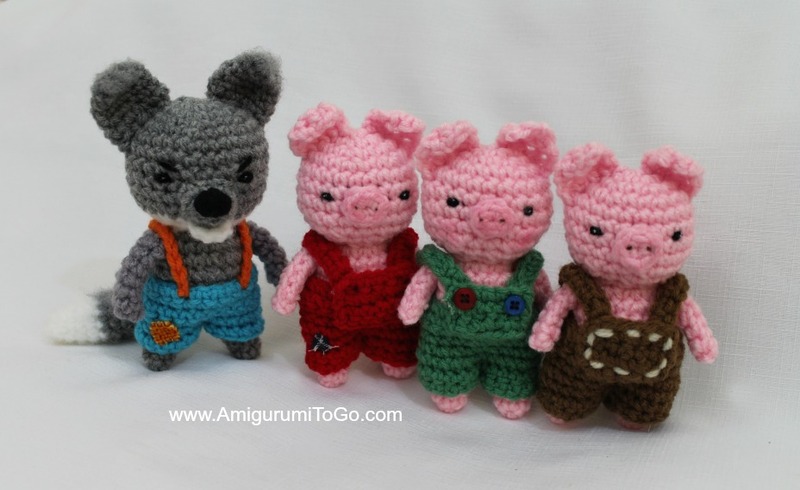 I've made a whole set of your Lil Teddy series, one pig, one mouse with dress, and now looking forward to making the Big Bad Wolf. Your instructions and videos are so clear. Thanks for the great patterns. Thank you for bringing joy to my life with your crations. Thank you SO much! Yes, there is something I can do. I just reported it and it will be removed shortly. Youtube is pretty quick to remove these stolen videos. I love your Little Bigfoot collection, especially the monkeys. Where I live there is no one who crochets things like these. I am looking for someone to make the monkey for me. Do you make them for sale? If so, what is the price? no, I don't sell anything, sorry. But I have videos that will show you how if you ever want to try. I just got done using your basic pattern, too make a puppy....for a very sweet little boy who requested one. My bf was so surprised when I showed him the finished toy! He couldn't believe I made it!